Ask a South African if they like shortbread and they might not know what you are talking about. However, ask them about "Eet-Sum-Mor" and they are sure to have eaten them at one time or another. My dad swears by them. He says they are the only biscuits he can eat that won't give him heartburn. Whether this is a fact or not, is debatable (but not with him!). The Eet-Sum-Mor name was given to these biscuits by Mr Albert Baumann, somewhere in the 1940's when he and his cousin came up with a way for a machine to make shortbread. You see, before that shortbread was made by hand. Any way, their Eet-Sum-Mors went on sale in Durban and the rest, as the cliché goes, was history...and so was my dad's heartburn! Just down the road from me, there is a baking/catering supply shop called...well, to be honest, I have NO idea what the place is called. Some long-timer expats call it "D.I.Y. 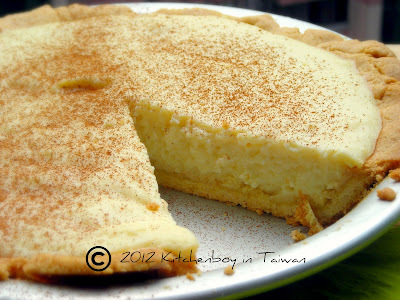 ", which is basically what the locals call anything (read cooking & baking) they can make by themselves. I call it the "Purple and Yellow shop" because...I'm sure you can work it out for yourself. Now I know that this is supposed to be all about home cooking and baking in my little train kitchen, but hey...it's my blog and I'll cheat if I want to! So, I was poking around in the freezers of the "Purple and Yellow shop", looking for puff pastry, when I came across these packets of frozen, pre-shaped, pre-cut Eet-Sum-Mor dough. See those evil pandas checking you out! And I thought this would be just the kind of biscuits that my (Taiwanese) god-daughter would like. Now these ones have a chocolate cross in the middle, but what REALLY caught by eye was the pack with the very angry and evil looking pandas! 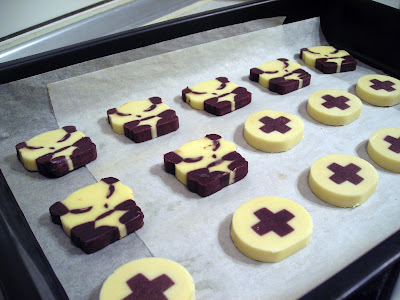 This is really so convenient and easy to make (if you can read Chinese, that is)! All you need to do it pre-heat your oven to 180C, open the pack and take out as many biscuits as you want to bake. It even comes in a very handy, resealable zip-loc bag! Space your biscuits evenly on a lined baking sheet and pop it in the oven for between 10 and 13 minutes. In the mean time, boil the kettle and make some tea. Or some steaming hot chocolate with marshmallows. Keep an eye on your biscuits as they can burn quite easily! When they've take on a light, golden brown colour, you can take them out of the oven, pour your tea and relax with your book. And hopefully you won't get any heartburn! 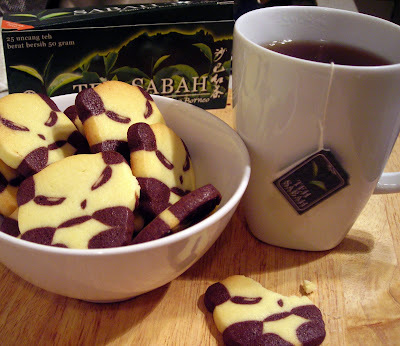 Evil Pandas and my favourite tea: Teh Sabah from Malaysia. My god-daughter Kylie Yao, eating an Angry Panda. Nee man - dit lyk bedonnerd, en Eat sum Mor is my favourite ook. Ek het gedink jy het een of ander cool resep om die goed te maak. Ek is absoluut mal oor hierdie koekies. Staar nou al minute daarna. En daai peetkind is 'n cutie! Dankie Arcadia! Ja klein Kylie is dierbaar. Ja, dis sommer baie cool! Ek het ook gewonder...dit moet seker soos 'n tandepastabuisie werk. Ek die pandas het per ongeluk so kwaai gelyk. Die ander was eintlik heel vriendelik! Ek moet weer gaan kyk watter ander patrone daar was, maar ek onthou daar was van hulle met sjokolade spikkels in. Dan dink ek daar was ook wat so 'n effe pers was, gekleur met tarro root. Jy's heeltemal reg, dis beslis "no mess, no fuss" koekies hierdie. En sommer lekker ook! Dankie vir die inloer, Marietjie! Is jy in NZ? Was lekker om in te loer! Great! Nou dan moet ons maar so oor-en-weer kuier. Is jy op twitter?